Review | Something Rotten! : Yes, it’s that funny! Autumn Hurlbert and Josh Grisetti. Photo: ©Jeremy Daniel. What if two brothers got together and decided to write a musical about two brothers writing a musical? (A few adult beverages, perhaps, and …) The brothers come up with a wacky idea about how musicals were born in Shakespeare’s theater world with the specific intention of showing him up. (Another cocktail?) By using Shakespeare’s own ideas. (And maybe towards the end of the night?) Discovered by consulting a soothsayer. Ridiculous, right? And such good fun! This is killer clever writing. 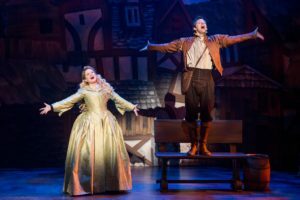 “Something Rotten!” running through April 8 at the Orpheum Theatre in downtown Minneapolis, is as funny as you’ve heard it is. It’s also a rarity these days on Broadway: a completely original work, not based on other source material. Well … except for ripping off bits of musical motifs from dozens of musicals, liberally quoting the Bard, and tossing in snippets of well-known lyrics, too. Shakespeare was known for “stealing ideas” and making them his own, so why not? Pick the most iconic moments, including visual ones (such as, the orphans in “Annie” scrubbing the floor), and there you are! The schtick couldn’t get much doofier, but there’s nothing doofy about the skill level of these writers. It’s enormous appeal is also, in part, because it laughs at everyone and everything – including Shakespeare and including the writers’ themselves. No one is spared; everyone gets an affectionate roasting. And it just keeps getting funnier. When people who really know how to write musical theater have no fear in running with an idea this wacky, a hit show is born. That simple. There were some major roles understudied in last night’s opener, but the performers were up to the task. Scott Cole starred as Nick Bottom and charmed his way through songs like “God, I Hate Shakespeare,” and “Bottom’s Gonna Be on Top.” I’m guessing his gorgeous mellow voice wasn’t quite the powerhouse the sound operator was used to. I thought he could have been bumped up above the chorus more. Josh Grisetti was absolutely convincing as Nigel Bottom, the conflicted poet and Nick’s brother. Maggie Lakis as Bea and Autumn Hurlbert as Portia led an ensemble of triple-threat women. This was a huge cast by today’s musical standards, and I could list them all as stars in their own right. They don’t just sing and dance, folks, they all tap dance! So, pardon me for mentioning so few. As an ensemble, they filled every corner of the stage with an amazing, relentless energy, particularly in the showstopper to end all showstoppers, “A Musical” – made twice as fun because the song tells you what it’s doing while it’s doing it. Lyrical genius! It certainly deserved the 10 Tony nominations it racked up in 2017. (It even made a joke of its no wins.) I think it wouldn’t have been skunked, but for some trip-ups in the second act. It had a little trouble getting to the ending, taking a slightly more circuitous route than was required. The ending, at last, was exactly right, but how it got there is a little murky. Writers Karey and Wayne Kirkpatrick really are brothers; they worked with John O’Farrell, British comedy writer, to create the show, a touring production, part of the Bank of America Broadway on Hennepin season presented by Hennepin Theatre Trust. Highly recommended, especially for musical theater buffs.